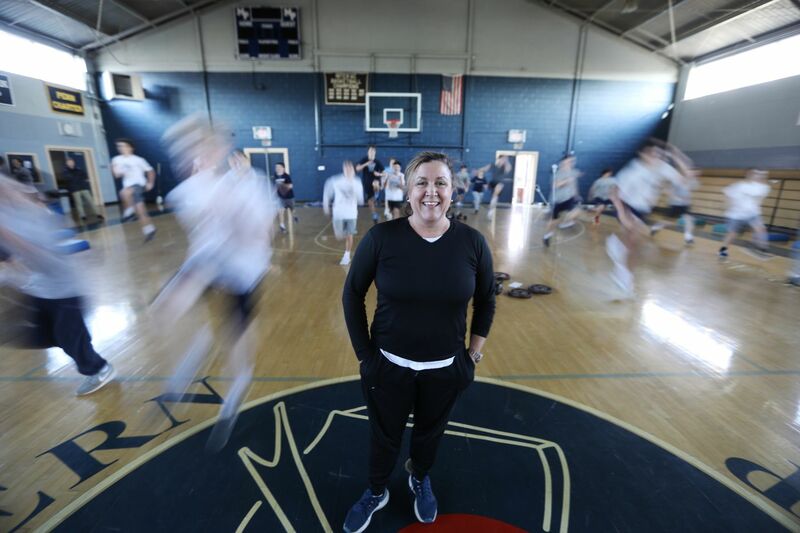 Mary Fran Frankenheimer works on strength and conditioning with the Malvern Prep lacrosse and football teams. Mary Fran Frankenheimer’s undershirt peeks out from under her black sweats. It doesn’t matter. Her focus is elsewhere. Counting down from three, Frankenheimer puts the Malvern Prep lacrosse team through a series of exhausting running-resistance exercises. This one-hour block during a recent practice, between 4 and 5 p.m., is Frankenheimer’s domain. She routinely orchestrates weightlifting and high-intensity workouts before the players are discharged to the field for the remainder of practice. Mary Fran Frankenheimer working with Jack Onderdonk in January. Malvern Prep senior Sean Rushton said that Frankenheimer combines fun with getting into better shape. McEvoy said he hired Frankenheimer because he wanted to keep his players in shape all year round. Previously, the team did not offer a consistent regimen for cardiovascular and strength training for the players. He knew of her athletic background and asked if she had any suggestions. She did, and she has been with the team ever since. “I think they approached me because they have respect for what I do,” Frankenheimer said. " It wasn’t like someone told them they had to pick me, because they didn’t have to pick me." A year after being hired by McEvoy, football coach Dave Gueriera asked Frakenheimer to work with his players. Both the lacrosse and football teams won Inter-Academic League championships in 2018. Frankenheimer is also an assistant athletic director at Malvern Prep. As a wife and mother of three boys, Frankenheimer said, she knows how to connect with young men. She said the great thing about her job is that McEvoy and Gueriera do not micromanage what she does. “I will connect with [the coaches] and say, ‘Is this what you want? You want it harder? You want it easier?’ ” Frankenheimer said. Frankenheimer, who attended Villa Maria Academy, was an all-American field hockey player at Randolph Macon College and earned her degree in elementary development and sociology. After college, she received certifications in athletic administration, aerobics, and body pumping from the Athletics and Fitness Association of America. She worked as an administrator at a cyber charter school and oversaw fitness classes before going to Malvern Prep five years ago. She also still teaches three classes a week at local recreation centers. Frankenheimer watches as Peter Sims does a resistance run. Frankenheimer said she has not faced discrimination at Malvern, even though it’s an all-boys school. The administration is, she said, making strides to expand its diversity among coaches and faculty. “I think this is the perfect job for me,” she said.